We want to builld a digital world based on universal access, open standards and unencryption. Encryption, subscription and other forms of digital exclusion lead to widespread welfare losses. They may have a role within the total broadcasting ecology, but the idea that they can successfully replace free-to-air public service broadcasting flies in the face both of economic theory and real-world experience. The online creative archive sounds amazing but would surely grow to a huge undertaking even for a public broadcaster like the BBC? I finally managed to blag an invite into the GMail Beta. First impressions are good. It’s claim to fame is the 1Gb storage available altough I struggle to see how I could fill 1Gb. Since Google announced this, others have been quick to catch up or overtake. Hotmail now makes available 250Mb instead of the measly 10Mb and Yahoo has gone to 2Gb for it’s broadband users. Yikes – lots of mail. A nice feature is the way the mail is held as ‘conversations’ so that the mails read like a forum posting rather than discreet entities within your inbox. Also, there is no concept of folders. Instead you tag your mail with labels (can be done automatically via filters) and the inbox is then split accordingly – the mail can have more than one label. Searching the mail is also easy and quick, although if it was anything else you’d be pretty shocked. All in all, very nice and certainly better then Hotmail. If you want to mail me, try the mail link bottom right and if your interested in getting an invite then let me know and when I get one I’ll be sure to pass it on. The next test is to see if it’s been blocked by the company firewall yet. John Swinney, SNP leader has finally stepped down. Really was about time – the SNP have had no better opportunity against Labour than in the last year, yet their share of the vote has still dropped. Swinney had no charisma or leadership qualities but did stike me as an honest and hard working guy. With any luck they’ll get a leader with a bit more drive, but looking at the list of candidates it’s hard to see where from unless Alex Salmond stands again which is unlikely. And I can’t see the nippy sweetie getting elected and heaven help them if the Star Trek geek becomes their leader. Yesterday was Graham’s Stag. 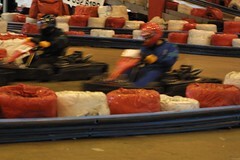 A 2 hour endurance kart race follwed by some food and beers. Was a really good day. There was nine of us so we split into two teams. Team 1 consisted of the bishopbriggs boys who eventually came second in the race. Team 2, including me, didn’t fair so well coming in 12th. Oh dear.